Both husband and I love our spices. So it was only natural that I picked up The Iraqi Cookbook from the library the other day. I had intended to cook a good many recipes from the book... but as it turned out, I simply couldn't get past "Timman Jazar" or rather my version of it for it was so damn delicious ! In Iraqi, timman means rice and jazar means carrots. So translated literally timman jazar means Rice with Carrots. I however could not resist throwing in some peas into the wok and so had to rename my 'timman' preparation thus.. Iraqi-style Brown Rice with Chicken, Carrots & Peas. In a large vessel bring 6 cups of water to a boil. Add the rice, cover and cook over medium heat for 30 minutes. Pour the rice into a strainer over the sink and let it drain for 10 seconds. Then return the rice to the vessel, cover and keep aside. Mix the grated ginger and mixed spices in 2-3 tablespoons of water and keep aside. Heat 2 tablespoons of oil in a wok. Add half of the chopped onions and the garlic to it. Cook till the onion softens. Stir in the ginger mixture and crushed tomato and cook till the smell of raw tomato is gone. Once the oil begins to separate along the edges and the mixture has thickened and reduced to half in volume, add the ground chicken to the wok. Coat it well with the spices and stirring occasionally cook it till the chicken browns uniformly. Add the green peas, carrots, 1½ tablespoon of cream of coconut, ½ teaspoon each of ground cinnamon and dried mint. Season with salt and pepper, mix well, cover and stirring occasionally, cook until the vegetables soften, about 15 minutes. Meanwhile in a separate frying pan heat the remaining 1 tablespoon of oil and fry the remaining chopped onions until they brown. Take care not to burn the onions. Now center the rack and preheat the oven to 375° F.
Once the chicken and vegetables are cooked and the onions are fried, spoon one-third of the rice into a 6 cup rectangular pyrex container or an oven proof container of similar capacity. Spread the rice uniformly in the vessel, top it with half of the the chicken and vegetable mixture, sprinkle half of the fried onions on top, repeat with another one third of the rice, remaining chicken-veg mixture and fried onions and finally put the remaining one-third rice on top. In a cup mix 2 tsps cream of coconut with ½ teaspoon of dried mint, season with salt and pepper and sprinkle the mixture over the stacked rice. Cover the container with an aluminum foil, poke few holes on it with a knife and transfer the container to the preheated oven. Immediately reduce the oven temperature to 350° F and bake for 15 minutes. Serve hot rice with a salad and yogurt. Since I did not have the ground spices, I mixed whole allspice, cinnamon, mace, cloves, coriander in the same proportion as mentioned above, ground them together in the coffee grinder, added 1 tbsp ground nutmeg to the spices and used the mixture thus obtained in place of mixed spice. Note that my spice mixture did not contain ground ginger. Hence I added grated ginger to the recipe. 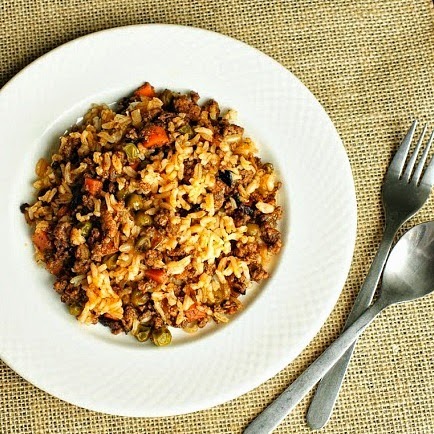 The rice recipe is inspired by the Iraqi Rice with Carrots and I found the mixed rice recipe at BBC Good Food. I don't think I've ever had any traditional Iraqi food, but your spiced rice looks wonderful!!! I have an Iraqi friend who makes the most delicious food. This rice looks so good! This is the type of meals I have been trying to make for my family. Tasty and healthy. Pinning. 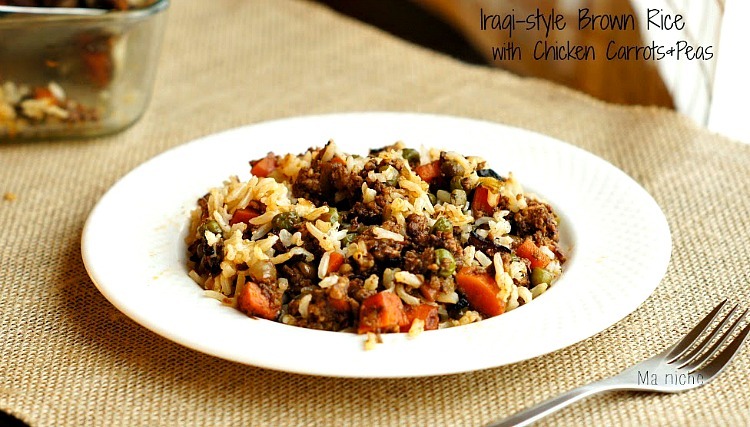 I've never had any Iraqi food, but we do love brown rice and your dish sounds delicious with a lot of layers of flavor. Visiting from Foodie Friday. Your rice dish looks great, I love cooking with different spices. Thanks for linking up to Sweet and Savoury Sunday, stop by and link up again. Have a great day!! We will just love this dish, it looks delicious! Thanks so much for sharing this great recipe with Full Plate Thursday and have a great week!